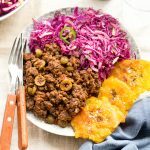 Whole30 Picadillo is a true family favourite! I’ve made it more times than I can count and each batch is better than the last! It’s easy, delicious, feeds a crowd and tastes even better the next day! You can batch cook it and freeze in individual packets for quick-and-easy weeknight meals. Or, you can make it for a special occasion! It’s always a crowd pleaser! 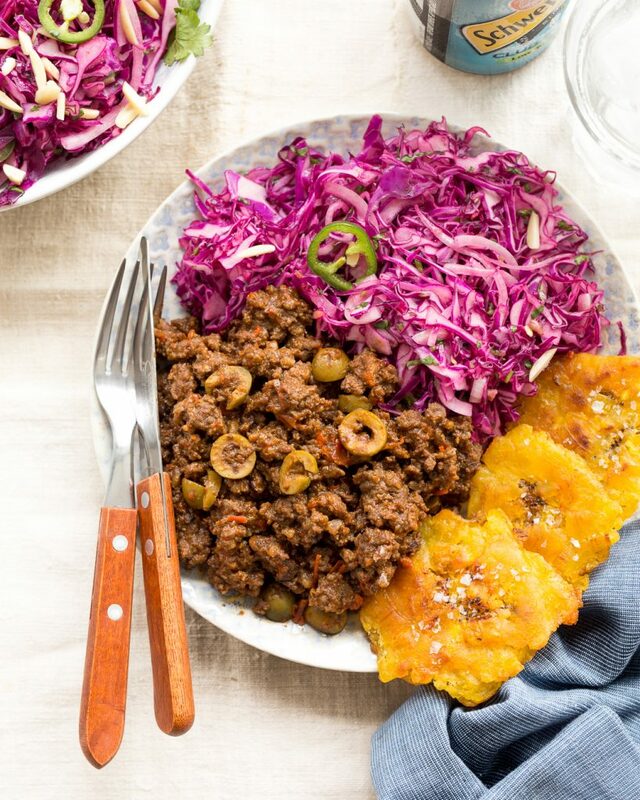 Lately, I’ve been serving this Whole30 Picadillo with a side of my Zesty Purple Cabbage Slaw and Tostones. Each recipe is Whole30 compliant and Paleo so they will suit your lifestyles year-round. Alternatively, you can try making what I call a “Paleo Fries Supreme” by serving the Picadillo overtop of my Baked Sweet Potato Wedges with some of my famous Guacamole. Top everything off with some thinly sliced radish and you’re in for a serious treat! For years, I only cooked Picadillo on the stovetop and still think that’s the best method for it. I think Picadillo tastes best when the sauce is nice and thick. By cooking it in a Dutch oven or sauté pan, you have more control on the evaporation of liquid. A soupy consistency is not what I’m after here. 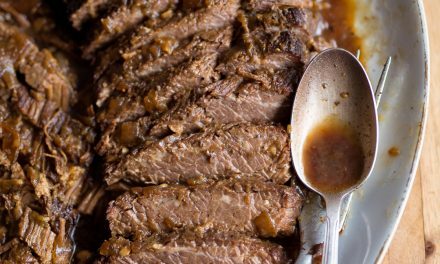 Note that the stovetop method requires at least 60min of gentle simmering for the meat to breakdown into tender morsels and for the flavours to develop. 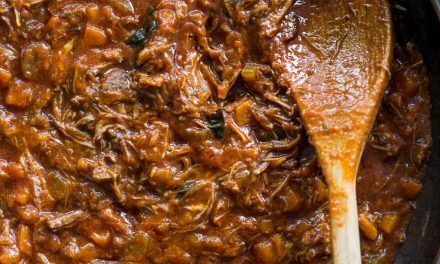 Aside from the occasional stir, it’s a very inactive cooking process and fairly reasonable for a busy weeknight meal that feeds the whole family. If, however, you find yourself in a pinch and time is of the essence, you can use an Instant Pot. You can cut the cooking time down to 1/4 of the stovetop version and still have a delicious Whole30 Picadillo. As always, if you make this Whole30 Picadillo in your Instant Pot you should still take the steps of browning the meat and sautéing the vegetables and spices. These steps will ensure maximum flavour and texture! More and more readers are requesting Instant Pot recipes and I’m happy to oblige. I truly love my Instant Pot. If you’re considering one or on the fence about purchasing, please read my full review here. 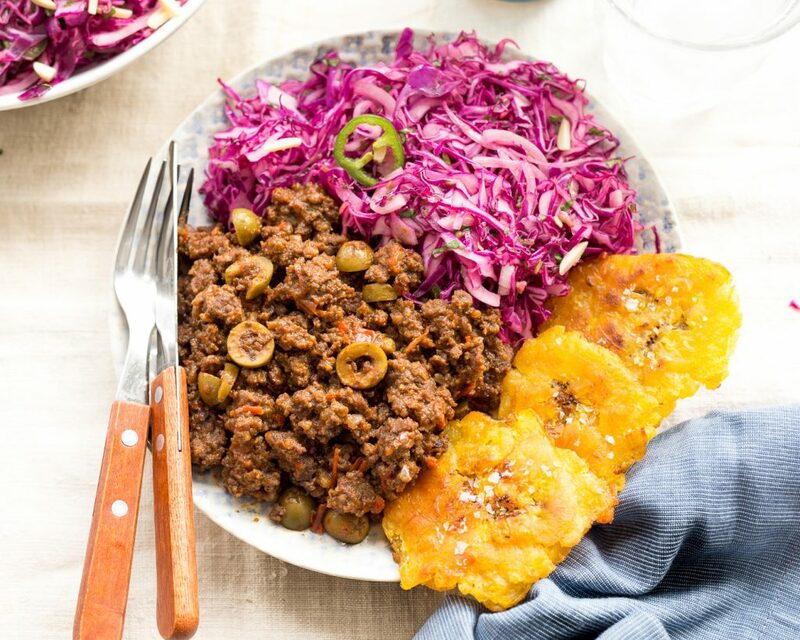 This Whole30 Picadillo is easy, delicious, feeds a crowd and tastes even better the next day! 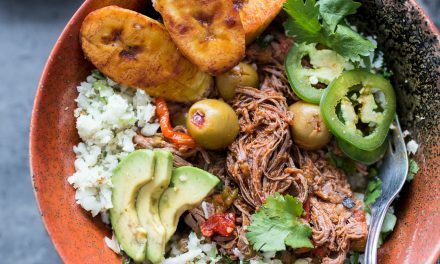 Try serving it with some of my Zesty Purple Cabbage Slaw and Tostones for a Cuban-inspired feast! Preheat Dutch oven or heavy-bottomed stockpot over med-high heat. Add 1 tbsp avocado oil and beef. Brown meat in batches, transfer to a bowl and set aside. Discard all but 2 tbsp of the rendered fat in the pot, reduce the heat to medium and add onions and peppers. Sauté until onions are slightly caramelized (approx. 8-10 minutes). Add garlic and cook an additional 1-2 minutes or until fragrant. Add paprika, cumin, oregano, ancho chili powder, kosher salt and black pepper. Stir everything to coat and toast the spices for 1-2 minutes. Deglaze the pot with the chicken stock, scraping off any brown-bits that have formed on the bottom of the pot. Add in the browned beef, bay leaves, olives and raisins - stir to coat. Raise heat and bring sauce to a simmer. Reduce heat to low, cover with a lid and cook 60min. Stir occasionally to prevent burning. Taste for seasoning and adjust accordingly. 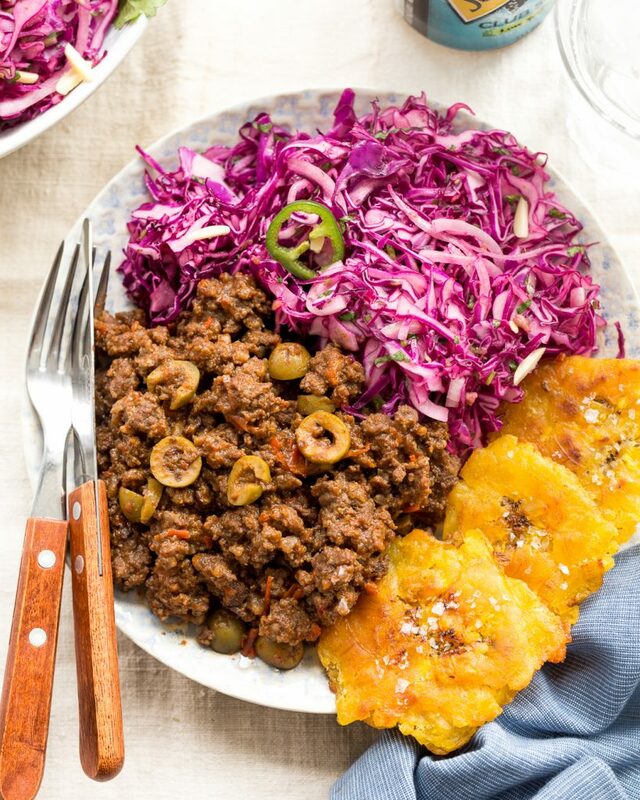 Serve with Zesty Purple Cabbage Slaw and Tostones. *Note: you can make Picadillo the day before and reheat at the time of serving. The flavours will continue to develop in the fridge over night and it will taste even better the next day! **Tip: If your Picadillo is a bit too ‘watery’, remove the lid and cook for an additional 5-10 minutes. This will allow for some of the moisture in the pot to evaporate. It will also concentrate the rich flavours of the Picadillo – a good thing! You are aiming for a thick yet juicy consistency that loosely coats the back of a spoon. ***Careful not to cook the sauce for much longer than 10 minutes or it may dry-out or burn. Set Instant Pot to Sauté mode. Add 1 tbsp avocado oil and beef. Brown meat in batches, transfer to a bowl and set aside. Discard all but 2 tbsp of the rendered fat in the pot and add onions and peppers. Sauté until onions are slightly caramelized (approx. 8-10 minutes). Add garlic and cook an additional 1-2 minutes or until fragrant. Bring sauce to a simmer. Switch setting to Manual mode, high pressure and program timer for 15min. Cover with a lid, set to valve to 'Sealing' position and allow Instant Pot to complete cooking cycle. Once cooking time has elapsed, depressurize manually. Switch setting to Sauté mode and simmer sauce until reduced to desired consistency. Taste for seasoning and adjust with salt and pepper as required. Hey Liz! Love the jalapeño stuffed olives! Sounds delicious! Really glad you guys enjoy the recipe as much as I do! 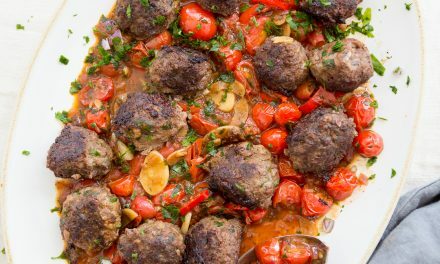 I’m making this for dinner right now! I saw it on your insta story a few days ago and I thought yummmm now that looks great! Thanks for the inspo! What can I use if I cant find ancho chili powder? You can substitute your favourite chili powder. I think it’s an underestimation when I say that my husband told me 10 times how much he loved this dish. I made it with the Zesty Purple Cabbage Slaw and tostones. I am forever changed. I think it’s an underestimation when I say that my husband told me 10 times how much he loved this dish. I served it with the Zesty Purple Cabbage Slaw and tostones. Life. Changed.